Cities is a slightly surprising name for the newest expansion to Antoine Bauza’s Kennerspiel des Jahres winner 7 Wonders. I mean, we were pretty much building cities before, weren’t we? I’d have gone with Shady Side of the City, maybe. We now get Torture Chambers, Slave Markets, Hideouts, Embassies and other dark places, so the name would fit. But it’s not all bad, we also get things like the Architect Cabinet, and architects are not generally dark. Except for the guys who planned most airports and railway stations, those are plain evil. Maybe a better name would be Peace and Money, because that’s what 7 Wonders: Cities is really about. If you have never played or read about the basic 7 Wonders you might want to check out that review first, this one will make a lot more sense then. The expansion brings nine new, black cards for each age. In each age, you mix one of these per player into the regular age cards. This means you now get eight cards per age, seven of which are played. Some card abilities are the known ones from the base game: military power and victor points. There are no new resource cards. But there are some new effects as well. The first of them relates to the peace part of my suggested title, it goes by the name diplomacy. When you play a card with the diplomacy symbol you take the Big Obvious Marker of Diplomacy that completely removes you from the war at the end of the current age. It doesn’t make you immune to attack – that would be a too potent way to deprive military players of their points – a better word is transparent. When you have a BOMoD, your two neighbours are considered adjacent to each other for bellic purposes. It’s a fine way to get out of an arms race. Shame you have to return it before the next age. Byzantium is a master of diplomacy and gets the BOMoD for stages of their wonder, the Hagia Sophia. The money comes in with two other new card effects. The first one is actually only semi-new, lets call it “You take a huge pile of moolah, but your neighbours get some, too”. The Gambling Den gives you nine coins, your two neighbours receive two. The other new effect is really new, and it’s likely to cause hate and despair. 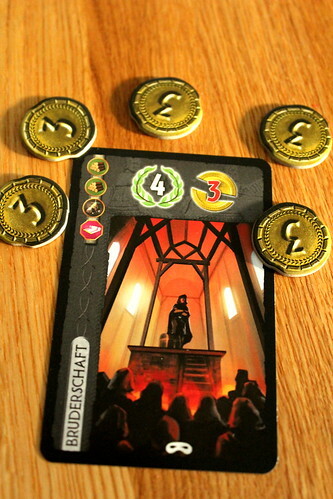 Some cards, when played, force every other player to lose some money: up to three coins as a fixed price, or one per stage of wonder or Victory Marker that player has. Losing money like that can even drive you into debt. Debt in 7 Wonders is a really bad thing, it can never be paid back. Sounds good at first, because you get to keep and use the coins you earn when you’re in debt, but each debt marker is worth -1 point at the end of game, compared to only 1/3 point per coin you own. While I like the idea of the BOMoD, the destruction of money effect irks me. Diplomacy merely forces you to pay attention further around the table when you’re trying to gain points from war. It also gives you another way out if you can’t or won’t invest in army points yourself. Destroying money at an inconvenient time, however, can pretty much destroy your game. I’m not even talking about debt markers but about losing hard-earned coins just before you need them to buy resources from your neighbour. A badly timed robbery can cost you a whole lot of points that way, and there is no way to defend yourself against it, so you may feel forced to play the robbery cards just to protect yourself from them. Just mark me down as “not a fan”. Getting robbed is even worse when playing Petra: stage two of Khazne al-Firaun, the Treasury hewn out of the sandstone, costs 7/14 coins for 7/14 points, depending on which side you play. Not getting those 14 points because of a robbery can make the game rather emotional. A third new card effect is very situational, but useful sometimes. Espionage lets you copy one symbol from a green card in a neighbouring city. If your neighbours are not interested in science, this card won’t doo much for you, but if they do you can copy cards that you have already built yourself and thus get more of one kind of symbol than you could otherwise. Remember that the score for those is the square of the number of cards with the same symbol, so if you’re lucky enough and your neighbours don’t pay attention, you might get something silly like 64 points in green cards only. Sweet, but rare. 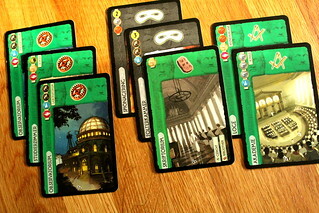 If you also own 7 Wonders: Leaders then Cities includes 6 new leaders to mix into the original one. They continue the themes of the expansion – more money and BOMoDs – and include some effects based on black cards: receive money or points based on them or build one for free. An interesting leader is Semiramis, a name that I’m now convinced means The Defiant One: each defeat marker is worth one point of military strength for him. Finally, Cities lets you play 7 Wonders with 8 players, huge plus right there. You mix 7 black cards into each age and deal 7 cards to each player, and you’re good to go. There’s also a team variant for four, six or eight players where pairs of neighbours play together. They may talk about their strategy and don’t go to war against each other, but other than that the team variant plays as normal. That means specifically you still have to pay for your partner’s resources, you cannot give him money and when you play a card that makes everyone lose money, it affects your partner two. I’d have been happier with this variant if team play included more, you know, team play. I can’t end the review without mentioning the Architect Cabinet again, just because it’s a very powerful card: once you have it, you don’t have to pay the resources to build the remaining stages of your wonder (Petra being the exception here, they still have to pay the coins). Actually, the effect sounds more powerful than it is, it may save you from giving some money to your neighbours, but it’s by no means game-breaking. 7 Wonders: Cities increases interaction between players with Diplomacy and the Espionage effect, two things you want to watch out for. In consequence, some players may take longer to take their turn because there’s more to consider now. It also adds the rob-you-blind cards that I already detailed why I dislike them. So it’s a bit of a mixed bag, the new things are more good than bad, but when given a choice I’d rather play the base game alone.